Anders Koppel er i sjælden grad en komponist af sin tid. Med det ene ben solidt plantet i den klassiske europæiske musiktradition og det andet ben i verdensmusikken og den rytmiske musik kan Anders Koppels virke som komponist ses som ét langt vedvarende arbejde med at forene disse kulturer i et nutidigt tonesprog. Saxofonkoncerterne er begge skrevet til Anders Koppels søn Benjamin Koppel, der er en af tidens mest vidtspændende saxofonister. I Andante - Largo - Andante 11:48 12,80 kr. II Adagio - Moderato - Tranquillo 6:56 9,60 kr. III Moderato - Andante - Allegro agitato 11:14 12,80 kr. I Andante - Allegro 6:43 9,60 kr. II Moderato - Allegro 7:17 9,60 kr. III Largo 8:57 9,60 kr. IV Allegro assai - Allegretto scherzando 2:45 6,40 kr. V Vivace 5:45 9,60 kr. Larghetto, tranquillo 3:30 6,40 kr. Anders Koppel is to a rare degree a composer of his time. With one leg solidly planted in the classical European musical tradition and the other in world music and rock/jazz, Anders Koppel's activities as a composer can be seen as one long continuous effort to combine these cultures in a contemporary musical idiom. This has resulted in a long succession of original works, all typified by a special ability to communicate emotions and energy strongly and directly between musicians and audience. In short, humanist music that brings people closer to one another. Right from the beginning music has played a major role in Anders Koppel's life. As a child he learned to play the piano and clarinet, sang in the Copenhagen Boys' Choir, and as the son of the composer and pianist Herman D. Koppel (1908-1998) he became familiar at an early age with reading scores and instrumentation. At the same time Anders Koppel (born in 1947) took an active part in the musical experiments that were part of the youth revolt of the 1960s and 1970s. In the years 1967-74, as the organist and lyric-writer, he was one of the bearing members of Savage Rose, one of the most prominent and innovative groups on the Danish rock scene. With a sophisticated sound idiom coloured by extensive use of keyboard instruments, Anders Koppel was already then breaking down the boundaries among the traditional genres. Since Anders Koppel left Savage Rose in 1974, he has increasingly immersed himself in the creation of contemporary composition music. Intensive work with film, theatre and ballet music has been an important precondition for his development as a composer, since many of the more than 200 films and productions for which Anders Koppel has written music have led to composition studies in a particular musical style or mood. As a consequence of this Anders Koppel today has an unusual ability to create visually evocative stories in music, both in chamber-music miniatures and in large dramatic concert pieces. Alongside his work as a composer Anders Koppel has been an active musician in among other configurations the group Bazaar, which for over thirty years has cultivated a unique expressive style characterized by improvisation, music from the Balkan region and Anders Koppel's own compositions. Since 1992 the trio Koppel, Andersen, Koppel with his son Benjamin Koppel (saxophone) and Jacob Andersen (percussion) has also played an important role. His experience as a performing artist constantly reminds Anders Koppel of what it takes to make a piece of music relevant to an audience. That is why Anders Koppel's music is also extroverted in the best sense of the word. Rather than cultivating a special compositional technique, his music often has an undogmatic, flowing character based on a classical view of tonality and the natural expressiveness of the individual instrument. Anders Koppel's musical vocabulary is extremely broad, encompassing among other things a fondness for Latin American styles such as tango, samba and Cuban music. This can already be heard in his debut work for a classical ensemble: a piano quintet from 1982, which includes a tango. His true breakthrough as a composer of concert music followed in 1990 with Toccata for Vibraphone and Marimba, which is virtuosic, technically challenging music that alternates with dreaming passages of enchanting beauty. In this Anders Koppel has found a style of his own that both enables the performing musicians to create performances of the highest standard and appeals directly to audiences. Anders Koppel has later sublimated these qualities into a succession of solo concertos where a single instrument plays against a whole orchestra. The concerto form is one that reaches out to audiences, since they can immediately identify with the lone soloist, and Anders Koppel is just the man to equip the instrumentalist with both intimate human feelings and hypernatural power and passion. This comes to expression for the first time in Concerto no. 1 for Saxophone and -Orchestra (1992), in Concerto for Piano, Strings and Percussion (1993) and in Concerto no. 1 for Marimba and Orchestra (1995) - and afterwards so far in 18 concertos for various solo instruments. -Anders Koppel has also composed several double concertos, including the Concerto for Flute, Harp and Orchestra (1998), where the elegance and poetry are akin to Mozart's classic concerto for the same ensemble, while the actual tonal idiom - with its magically impressionistic treatment of sound and sensually dancing character - is Anders Koppel's own. Anders Koppel's vocal works play a special role. In the cantata Gemmer hvert et ord (‘Treasure Every Word') (1998), which was written for choir, brass band and organ in memory of the Battle of Fredericia 1849, the concertante element is absent. Instead the music is typified by an inwardness that is finely attuned to the text, whose content, taken from old soldiers' letters, provides thought-provoking insights into the great human cost of war for the individual soldier. It is quite a different matter with the opera Rebus (1999-2000), which is a parodic mosaic of modern man's meandering between hectic smugness and existential crisis. Here Anders Koppel, with inspiration from both Dadaism and the Fluxus movement, has composed for both rock/jazz and classical singers as well as the crossover ensemble Mad Cows Sing, who together create an ebullient musical evocation of the questing transitional humanity of the turn of the millennium. In Concerto no. 3 for Marimba and Orchestra (2002-03) composed for the Austrian marimba virtuoso Martin Grubinger, Anders Koppel has given his music greater symphonic breadth. The tonal idiom is still characterized by rhythmic energy, but the kaleidoscopic play with genres and styles has been toned down in favour of more classical formal thinking, where the individual work constitutes more of an organic totality. This path is pursued in among other works Concertino for Two Guitars and Chamber Ensemble (2003), Concerto no. 2 for Saxophone and Orchestra (2003) and Concerto for Saxophone, Piano and Orchestra (2005). In the Concertino this leads to a synthesis where the original Latin temperament of the guitar is given a tone of Nordic coolness, while in the second saxophone concerto Anders Koppel cultivates an expressive style where effects from the jazz and big-band tradition are ingeniously merged with the large classical concerto form. In the double concerto for saxophone and piano Anders Koppel has taken yet another step in the direction of creating music characterized by simplicity despite the cultivation of external magnificence and bravura. This brings Anders Koppel back to one of the insights of his earliest youth. At the age of 12 he formed a study circle to research the thinking of the Danish social critic and literary scholar Georg Brandes. The members included Brandes' more than 90-year-old daughter, and one of the topics was the idea that in art it is possible to express the infinitely great in the infinitely small. For Anders Koppel today this has developed into a growing interest in basic musical elements, such as the individual motif and the actual musical form. With this came increased inspiration from composers like Beethoven, Schubert and Sibelius, each of whom in his own way mastered the art of creating integrated works of art with a starting point in a limited body of material. Although Anders Koppel's music often has a strongly visual appeal, it is still absolute music that is not determined by any external plot, since it is the musical content itself and the built-in contrasts that bear the music onward. An exception, however, is the Concerto no. 4 for Marimba and Orchestra (2005) with the subtitle In memory of the transitory\. When the concerto was commissioned as part of the Mozart celebrations in 2006 for a world premiere in the Musikverein in Vienna, Anders Koppel chose - besides the large symphonic orchestral ensemble - to use the organ in the legendary concert hall. This gives the music a sacral dimension that prompted him to associate an experience of his own with the concerto as a kind of programme. The experience took place when he was on a long car journey on a hot summer's day in Sweden, where Anders Koppel and his wife stopped in a dark forest. By chance they found an overgrown memorial on which was written:"In memory of the transitory". This enigmatic utterance inspired him to weave one of Mozart's strokes of absolute genius - the piano movement Rondo alla Turca - into the virtuoso marimba part in Concerto no. 4 for Marimba and Orchestra. This particular Turkish-inspired piece by Mozart was especially well chosen, since it is not only a nod to one of the greatest composers in history, but also an expression of a deeply felt artistic belief Anders Koppel has: that music - and our culture as such - is fertilized by the encounter of different traditions. At the same time he succeeds, despite the programme's message - disheartening in its way - about the transience of all things, in creating a life-affirming experience by purely musical means. This also underscores how the bearing content in Anders Koppel's art is tied in with the music's own inherent power. Ideological messages - whether musical or social - are therefore never the point of departure for Anders Koppel's activities as a composer. They are rather a bonus that follows from the work of creating relevant contemporary music through an unprejudiced use of the musical heritage in all its diversity. The saxophone is one of the instruments that Anders Koppel has composed for most often. One explanation of this is that the saxophone, by virtue of its unusually wide acoustic and dynamic range, is the perfect vehicle for Anders Koppel's expansive musical language. The sound of the saxophone can modulate from the most refined and transparent to the downright aggressive and raw. Both extremes are represented in Anders Koppel's musical aesthetic. And just as the saxophone has a special ability to move freely between the classical and the rock/jazz tradition, Anders Koppel's music is capable of pointing out new musical paths among the usual genres - a quality also familiar from Gershwin's music. Another explanation of the saxophone's prominent position in Anders Koppel's oeuvre is that since the beginning of the 1990s he has had a close artistic collaboration with his son Benjamin Koppel, who is one of the most wide-ranging Danish saxophonists today. 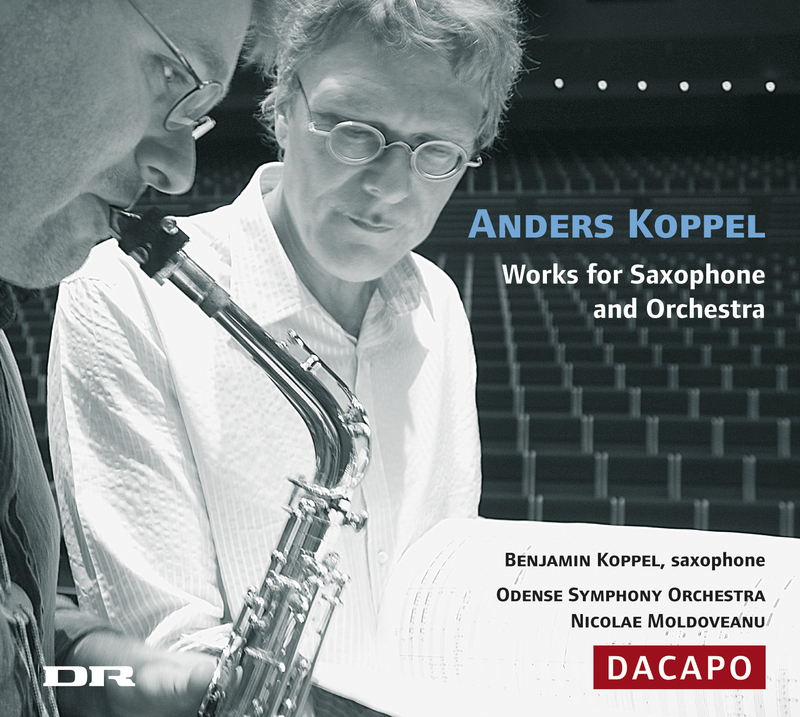 Both of Anders Koppel's two saxophone concertos were written for Benjamin Koppel, and exploit his ability to alternate uninhibitedly between virtuoso passages in a rigorously composed sequence and original, imaginative improvisations. Benjamin and Anders Koppel's collaboration picked up speed in earnest when Benjamin Koppel was the soloist in the first concert performance of Concerto no. 1 for Saxophone and Orchestra, which took place at the NUMUS festival in Århus in 1997. In the same period Benjamin Koppel formed the cross-over ensemble Mad Cows Sing, for which Anders Koppel has composed a number of works with the saxophone in a prominent role. Anders Koppel's other works for saxophone include Serenade for Saxophone Quartet (1992), Capriccio for Sax, Cello and Piano (1994) and Concerto for Saxophone, Piano and Orchestra (2005) with its world premiere by the Danish National Symphony Orchestra/DR in the autumn of 2006. Concerto no. 1 for Saxophone and Orchestra was originally composed in 1992, but is heard here in a revised version from 2004, which makes more use of the symphony orchestra's broad palette. The duration of the concerto has also been increased, since Anders Koppel has taken more time to characterize and unfold the individual sections in the concerto. Yet it is still a classically coloured concerto, where the two fast outer movements in particular share features with the musicianly dialogue between soloist and orchestra of the Classical and Baroque eras. By virtue of a number of improvised solos and cadenzas along the way we even come unusually close to the practice of earlier times, when true improvised passages were an integral part of the concerto form. As a contrast with the fast, rhythmically telling sections of Concert no. 1 for Saxophone and Orchestra, Anders Koppel has inserted a number of evocative lyrical passages that imbue the concertante style with a magical element. This can be felt for example in the ethereal introduction - and ending - of the first movement, where the bright-sounding soprano saxophone is wrapped in a robe of delicate string sounds with added bell notes on the celesta. In the calm second movement the soloist changes to the darker alto saxophone, which in an interplay with among other things a so-called alto flute and high, hovering strings, creates a dreamlike nocturnal mood. Sudden eruptions from the lowest strings and ominous melodic fragments in the woodwinds do however create a feeling of dark, threatening night clouds, and a Mahler-like dirge is hinted at first in the cellos and later in the solo saxophone. This music seems to be played with bated breath, and the gathering eeriness calls for a resolution that comes when the whole symphony orchestra unites in a mean rock groove. This creates a background against which Benjamin Koppel can plunge into a luxuriant saxophone solo that clears the mystically charged air. Concerto no. 2 for Saxophone and Orchestra, unlike the first concerto, takes the form of a long continuous sequence. Along the way a number of shifting moods are played through, together making up a magnificent fantasia, characterized by both orchestral effects and a sometimes chamber-music-like dialogue between soloist and orchestra. This happens for example at the beginning of the concerto, where a high solo violin hovering against the backdrop of a faintly tremulous string tapestry so to speak forms the runway for the alto saxophone's first solo flights. Midway through the concerto, too, in a calm adagio section where the music elaborates on the refined sonorities of the beginning, saxophone and violin meet in a still shadow play. This music of vague presentiments creates an ethereal framework around the more insistently fast main section of the concerto, where saxophone and orchestra challenge each other in close bodily interplay. It is music with a direct physical appeal and a fundamental feel of dance-like elegance; at times with romantically dreaming episodes that recall a scene in a ballet by Tchaikovsky; at other times the symphony orchestra plays with jazz elements that create references to the vital pulse of a big band. Afterwards comes a teasing scherzo where the low brasses grow comical, inviting us up for a skewed, syncopated dance, while the saxophone like some circus artiste plunges into a rash tightrope walk with a twinkle in its eye. Then the concerto culminates in a marvellous virtuoso finale dominated by hyper-activity and zany narrative exuberance for both soloist and full orchestra. Thus it turns out that Concerto no. 2 for Saxophone and Orchestra, despite its playful freedom with styles and orchestral colours, is in purely formal terms cut from whole classical cloth consisting of four movements - fast, slow, scherzo, fast - all making up a harmonious whole. The CD ends with Swan Song, a small instrumental jewel originally composed in 1987 as the title theme for a radio adaptation of Selma Lagerlöf's Niels Holgersen's Wonderful Journey. The piece is typified by an inwardly lyrical tone and here, where Swan Song is heard in a new orchestral version with Benja-min Koppel as soloist, the little encore piece has the character of a jazz ballad wrapped in golden euphony. Indspillet i Carl Nielsen Salen i Odense d. 26. September - 1. Oktober 2005. Produktionsassistenter: Torben Laursen og Niels Flensted. Redigering: Troels Møller, Anders og Benjamin Koppel i Gaardhuset. Forlag: Norsk Musikforlag (Koncert nr. 1) og Edition Wilhelm Hansen AS, www.ewh.dk (Koncert nr. 2, Svanesang). Augustinus Fonden, Dansk Komponistforening/KODA’s midler til sociale og kulturelle formål og KODA’s Nationiale Blankbåndsmidler. Denne CD er indspillet i samarbejde med Danmarks Radio.